We see it over and over in His Word. Stories that prove how God never leaves us fending for ourselves when problems arise or seem too big. Miracles that remind us when we leave the battles in His hands, He can do what would be impossible for us to ever accomplish on our own. 1. God knows what He’s doing. 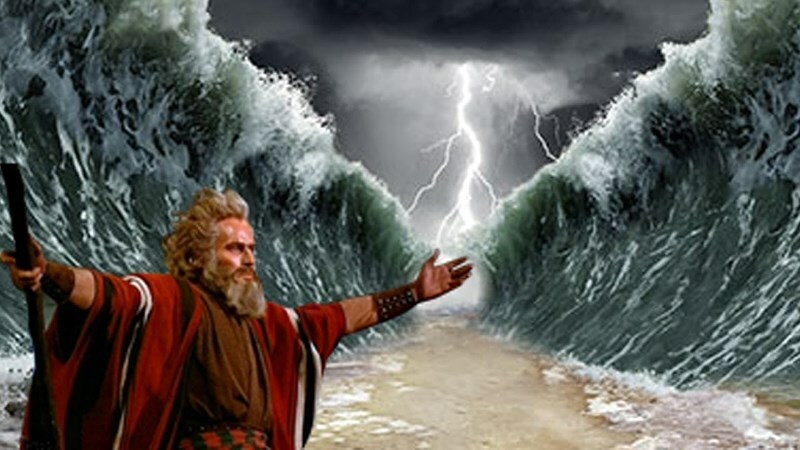 “So God led the people around by the desert road toward the Red Sea…” Ex. 13:18 Even if the way He’s leading doesn’t seem to make much sense and His timing seems off, or the wait and journey get long, and wandering in desert places is the last thing we want to do, we can trust Him. Always. He knows our way. He sees the big picture. He has good in store. And though it may not have been what we would have chosen, or how we would done things, we can thank Him for His Sovereignty, His care over us, and His leadership. 2. God leads our way. “By day the Lord went ahead of them in a pillar of cloud to guide them on their way and by night in a pillar of fire to given them light…” Ex. 13:21 God will not leave us to fend for ourselves, struggling to find our way. He will lead us. He promises to. We may not see him in a pillar of cloud or fire these days, but we have His Word, and the Holy Spirit to give guidance to our days. He is with us, He gives wisdom, He provides direction, so we never have to fear being left on our own to figure things out. He goes ahead of us, He walks with us, and He guards our way from behind. His Word gives truth and life and shows us the way to walk in this world. 3. God is able to turn the hearts of kings. 4. When we see obstacles, God sees opportunities. He will make a way where there seems to be no way out. The bigger the problem, the greater his ability to shine right through it all. “The Egyptians – all Pharaoh’s horses and chariots, horsemen and troops – pursued the Israelites and overtook them as they camped by the sea…” Ex. 14: 9 Things were looking bleak and dark, yet God had a plan. And it was amazing. 5. We can focus on the problem or we can choose to trust God. God may ask for stillness and trust and other times he might say, “Get going and keep trusting.” God said to Moses, “Why are you crying out to me? Tell the Israelites to move on.” Ex. 14:15 It’s so important to listen for his voice, to know when to be still, and also to know when to get up and move forward. His voice will lead us, He never leads in confusion, but always with assurance and clarity. There’s times in life when we pray about a decision and even though God shows us what to do, we get stuck along the way. So we just say we’re still “praying about it.” Over and over. Instead of moving forward. And doing what He’s already said to do. If we ask Him for wisdom to know the right steps to take, he will always provide direction. He will open doors on our behalf and close those that need to be shut too. 7. God will work powerfully on our behalf, but He often asks for our obedience first. Not even a hint of sinking sand. As God’s children, we aren’t destined to walk in mud and mire. He dries up the path before us so we’re heading out on firm ground. He is our sure foundation. Our obedience to His voice will always lead to blessing. 8. God will stand between us and the enemy. We never fight alone. He will send his angels to fight for us and guard us. He Himself will fight for us and guard us. That’s how much He loves us and desires to set His protection over us. “Then the angel of God…withdrew and went behind them. The pillar of cloud also moved from in front and stood behind them…”Ex. 14:19 He will hem us in from all sides and keep us under His care. It doesn’t mean we won’t ever face the battle, but we can know that He is surely with us in the midst of it. 9. Our God is a God of miracles.